In my last blog, we covered a few simple concepts related to safety around other horses in the barn. Standing tied is also an important aspect to barn safety. Many horses feel restricted due to their natural claustrophobia when they are tied. 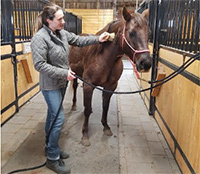 The approach I use to introduce a horse to being tied develops their confidence, additionally educating the horse how to respond to pressure on the rope in a positive way. This technique can work for single rope tying to a wall, and cross tying in an isle with two ropes. A more traditional method to teaching horses how to stand tied relies on leaving the horse tied using a strong enough rope to a strong enough post until they give up struggling to free themselves. I have seen enough horses who have been trained using this approach to share a few words of warning. There are very delicate muscles layered beneath the fascia located at the poll, just behind the ears where the halter rests. Horses who pull back violently on halters are at high risk of damaging this fascia/muscle balance, which can contribute to many physical and emotional challenges during training and everyday life for the horse. Additionally, the terror that goes through their mind while fighting for their lives to free themselves from the situation is simply inhumane. Think of tying as a handy option to free up your hands with your quiet, relaxed horse. Horses who are nervous tend to be the types that pull back out of reaction when they feel pressure in the rope. It is also safer to avoid tying an antsy horse in order to gain control over him. The opportunity to move his feet in a structured manner when he is feeling stressed usually helps settle horses down quicker than if they are continually banging into the end of the rope. Slide a long rope (12-18 ft) through a tie ring on a post or wall. One end is connected to the horse’s halter, while you look after all the extra rope on your end. Allow the horse to move. Hold your end of the rope as though you are the tie, so as he moves he can feel some restriction. When he pulls back and feels pressure in the halter from the rope you can determine his level of knowledge about how to respond to pressure. Does he pull back harder, or does he soften to the rope and move towards the direction of pressure to find release. The long rope gives you room to allow a pulling horse to move his feet until he is less concerned about the restriction. Once he stops moving, maintain a similar amount of pressure in the rope until he decides to release the pressure himself by moving forward again. This is the key – the handler’s timing and “feel” is very important. Once the horse creates pressure on the rope, it is the horse who must replace the slack in the rope. BUT the handler is not pulling on the rope in order to force the horse to step forward to find the release. The handler must wait patiently for the horse to think, consider his options, and choose the correct option – moving toward the pressure to find the release. This goes against the horse’s instincts, and is, therefore, a very important lesson to teach them in a safe and relaxed environment. This horse backed up until the Slide Rope cross ties became taught, my hands remained soft, no pulling needed by the handler. Once he looked behind himself at the scary door he was then able to relax and responded to the pressure by stepping forward again, creating his own release. Tie using a quick release knot once the horse understands confidently how to respond to pressure. Here’s a how to video. Safety is a priority in the barn. Even horses who usually tie quietly can be spooked. I prefer to use a small metal clip called a Blocker Tie Ring in any situation where I am tying horses. The mechanics of the Blocker Tie are very similar to the approach I outline above for teaching horses how to respond to pressure without risk of injury. Practicing grooming while standing with Slide Rope Tie technique. The Slide Rope Tie can be used to teach horses to cross tie, tie in the trailer, wash stall, etc. Horses who have had accidents while tied tend to be more reactive. This approach can help them learn to soften to pressure, and to think before reacting. Check us out at FreeReinHorsemanship.com for more horsemanship tips.